Level 5 is heading to irrelevance this generation if they don't find a hit on Switch. Only Pokemon can save them now. Fantasy Life 2 should be a Switch title. It's a perfect fit for the platform. Change the gameplay perspective to more behind the back than top down, make the world bigger. Keep the charm and jobs system. Add more of everything. Just an hd, slightly more detailed version of the graphics from FL1 would be beautiful. I'd buy it day 1. I think the problem isn't if Fantasy Life could be successful or not. I mean, there are Level-5 IPs that really could sell hundreds of thousand. It's more if they could recover from that big, but very big, decrease on revenue due to the Yo-Kai fever in '14. They should realize they're not gonna have another one in the short term, and eventually could hurt their fiscal revenue. 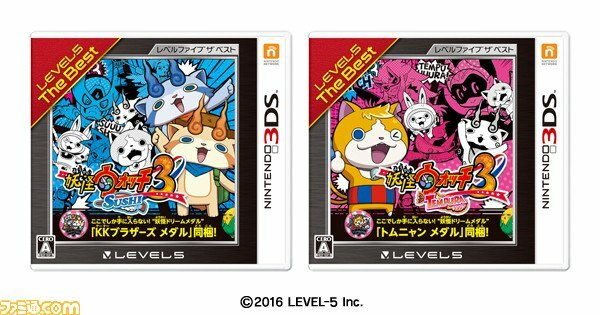 Are there other businesses where Level-5 is involved and kinda successful? Level 5 should have stuck to creating and diversifying small scale games, not drain their reserves wrought from those small-scale successes to produce large-scale bombs and milk their money-makers. Can someone explain why Vita sells so poorly over in Japan when the PSP had much longer legs? Similarly the legs on the 3DS is incredible. Are they getting software that we are not getting in the west? Because the lineup for the Vita has been better in the west than the 3DS over the last six months - obviously that's subjective, but the way 3DS is still selling is incredible, while the Vita has dropped 50% from last year. If its literally over one game that's kind of annoying, Sony should have paid up. Vita does not have desirable software while the 3DS does. It is as simple as that. Pokémon Sun and Moon released six months ago so there's no way that's true. So there is a new Yokai Watch sku coming out this year. Because Sony literally tried to murder any legs that Vita could had by keep pushing Jp developers into PS4 ecosystem even when Jp devs still preferred Vita. And also, 3DS actually got games that mass audience ones while Vita is getting zero of those thing. Simple. The 3DS has desirable software and the Vita is no longer getting those. So, Level 5 is launching Snack World, Lady Layton, and a best release of YW3 in two weeks. Best July ever keeps on getting better. July is going to be a blood bath. Expecting some massive SW sales overall but a lot of games are going to be left in splatoon and DQ's wake. Don't forget about Dragon Quest. Because Nintendo being a prick and stole Sony's games, it's an unacceptable practice and companies like capcom, atlus and square should have cancelled monster hunter, bravely series, shin megami tensei 4,etc 3ds versions and port them to the vita, where those games should have been, that's a fact. That's assuming that Monster Hunter was ever for sale. 3DS still sells because it provides a cheap entry point for a fantastic library of games. Meanwhile, the premise of the Vita is succeeded by the Switch. Between the two Nintendo offerings, there's no room for the Vita anymore. Looking at the sales chart, I didn't realise that the software sales in Japan was literally filled with 3DS titles. But many of these titles are oldies like Mario Kart 7 or Animal Crossing. Some well known franchises like Dragonball or Monster Hunter. Although the west still gets the same titles, there's no way the sales charts would have as many 3DS titles on it. It would be predominantly PS4. That's why it seems like the 3DS is not as popular in the west. And as for the Vita, based on the charts it seems really dead. the next media creates chart will be uploaded later today,right? Is there any proof that Sony were pushing developers into PS4 ecosystem? I think it's more of the developers themselves wanting to sell their games worldwide where Vita is pretty much dead. It's the same reason why many of these games are released on PC/XBO too outside of Japan. Ummm. Check Sony push after their big hunting game effort for Vita flop in Japan? After all those hunting games like soul sacrifice and that prisoner game is unable to bring some fire toward Vita hardware sales, u see Sony focusing on Ps4 as more or less all game is coming to ps4 and with no more psv port or the psv port quality is just bad. 3DS in japan is not going to die that soon considering in just few months behind, 3ds still got MHXX, Mario Sports, and Fire Emblem. And of course there is still quite a number game coming on mid size like Layton which can bring some number too. Having moar evergreen titles is also very helpful. I don't understand your point. I was asking for proof of your claim that "Sony literally tried to murder any legs that Vita could had by keep pushing Jp developers into PS4 ecosystem even when Jp devs still preferred Vita" in your previous post. How does "Sony focusing on PS4" equate to "Sony pushing developers into PS4 ecosystem"? Heck can you even say that Sony (SIEJA) are focusing on PS4 when they've barely released anything on it? yeah I don't think there's any proof Sony pushed anyone into one or another platform. what they did though is admit defeat, pretend the Vita does not exist and bring some of their Vita efforts to the PS4 to recoup some sales, Tearaway and Gravity Rush in particular. is that the blog that "leaked" the Vita successor or something? No one leaked anything about a Vita successor. People who either cannot read Japanese or got overly excited by nothing decided that random speculation on slow news was worth making a thread over. It would be like taking a post in a MC thread where someone ponders about the possibility of a PSP3 based on some recent unrelated pieces of news and then someone else make a thread quoting all that going "RUMOR: PSP3???" Do we know if there is any improvement of Snack World Anime one month later? Nope, haven't seen anything really. I really wish Video Research provided a Top 20 instead of a Top 10, because you never get data for 99% of new shows (only those that are truly successful). For example, this week, the only non-permenant shows in the Top 12 is Boku no Hero Academia. All the other spots are regular, non-seasonal shows (Sazae-san, One Piece, Pokémon, YW, etc.). About The Snack World specifically, it probably wouldn't change much I'm afraid. I was expecting a re-release later down the line, but after 4.0. Guess they'll also have one for Sukiyaki at the same time as the movie, in December. PSP has actually been successful, Vita was niche from the beginning. 3DS is the dedicated gaming device with by far the biggest active audience in Japan. Switch is catching up in mind share, but in numbers it will take time. Home consoles are pretty much irrelevant in Japan since the fast rise and fall of the Wii. PSP3 is absolutely going to happen. And I think Sony will take a close look at Switch when designing it. I dont see Sony giving up that easily. They made good money on the PSP. Sony doesn't see getting out of handhelds as giving up, they see it as a sound business move. They haven't even had a Vita commercial for like 4 years. It's not like they suddenly lost interest in handhelds, they have been tepid about them for years now, and have long transitioned everything to PS4. There is pretty much no reason for PSP3 to exist. There is no market for it. Even if it was exactly the switch concept without a significant power bump it's not getting ports. And unlike the Switch which will build its sales with the strength of first party releases Sony can't do that. It's a largely pointless path for Sony to go down. The gains would not support the effort. This. Taking the PSP as an example doesn't work after what happened with the Vita. Or Nintendo going from the DS to 3DS sales. Pretty much all the hardware makers are shifting to a "console+1" direction. For Nintendo and SIE it's their newest console plus mobile. For Microsoft Studios it's Xbox + Windows. There is no reason to think a third Sony handheld is coming out. They are focusing all their efforts on the console side of things. Aside from the fact that it doesn't make business sense for them, I doubt retailers or consumers would care for it considering that Sony let the Vita die after the first year. Guess we can expect about 25k for Switch until ARMS is out. Ehh I don't understand this narrative. If Sony really did let the Vita die after the first year, we wouldn't be seeing games still being released for it today. I'm sure they've been continuously working hard with third-party publishers to secure titles for it, including some bigger/more popular ones such as Dragon Quest spin-offs, Monster Hunter clones, Musou etc. However, there's only so much they can do when Nintendo have all the juggernauts (Monster Hunter, Yokai Watch, Pokemon, Mario etc) exclusively for 3DS. People are mainly saying that because Sony themselves didn't make much for the system. Like we never saw anything from Naughty Dog or a major game from Santa Monica on it, did we? Sure, but Nintendo is showing how you can go with the times and release a compelling product for on the go play. Sony can do the same, they're not incompetent. Everyone is acting like handhelds cant find success anymore. Im not of that opinion. It just takes the right product at the right time. There's no chance of Attack on Titan: Escape from Certain Death being localised, right? Nintendo systems for the last 20 or so years are sold off the strength of their internally produced games. Sony systems are sold off the strength of third party games. Do you think that Sony is going to produce a popular, strong system that makes third parties want to port their titles? I don't. Even on the PSP the big studios didn't put much (if anything at all) too. I'm talking about SIEJA. They rarely put out anything, be it on Vita or PS4. Anyway Naughty Dog never made a game for PSP either.